Now that’s a slice. Early Avocet tires had a reputation for slicing. 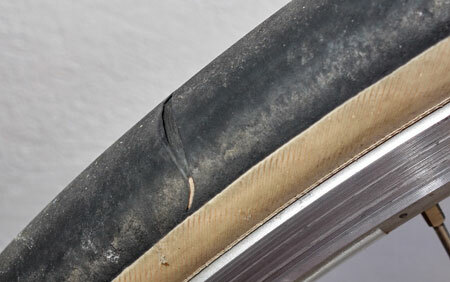 You may wonder how my 26-year-old Avocet tire held up. It lasted eight weeks, about 850 miles. I could have gotten another 200 miles on it, but I had to change tires for a trip. That’s nothing to write home about. I’m told most fancy narrow lightweight tires last about 1,000 miles. When I told friends I was riding the tire, they acted like I was taking my life into my hands. Well, I suppose the implied warranty would have expired about 25 years ago. The tire held up well, but the rubber sliced badly. Avocet’s early tires were known for slicing, which was addressed in later versions. Traction was great, but tire life suffered. Avocet tires had superior casings. Even though the tire shredded, the casing never had issues. So far the best tire has been the Continental Grand Prix 4-Season. Talk about tough. It’s expensive for a reason. This entry was posted on September 6, 2012 at 7:10 pm and is filed under Products. You can follow any responses to this entry through the RSS 2.0 feed. You can leave a response, or trackback from your own site. Was that on the front or rear? My (identical) tire is at about 3100 miles, but it’s on the front. The center seam is still barely perceptible and the tire is holding up great. It was on the rear.